If you should damage your kite, don't despair! There's almost nothing that can't be fixed on a sport kite, and most of the time you can do it yourself with a few simple tools. 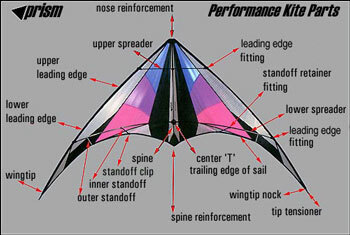 After you've been flying a while, you'll probably want to carry a few spare parts and useful tools in your kite bag so you can make your repairs at the field... Just below, you can see a diagram describing each part, courtesy of Prism Kites. You might also benefit from watching some of the fine video tutorials available these days... They tend to make the learning curve a lot easier, and will help you to cut down on repair situations by gaining better control of your kite(s). This video will take you from assembling your kite through intermediate aerobatics. If you’re just getting into sport kites, It’ll give you everything you need to start having a great time with your kite. This video is the next best thing to private lessons with Mark and the gurus at Kite Hill. It’ll get you going with the basics of trick flying- stalls, axels, ground recoveries- then take you through to some of the most advanced moves being done today. Step by step instructions, animations and split screen graphics make it the single best teaching tool on the market. This highly entertaining video is fast and furious freestyle flying performed by Mark Reed himself. Though not designed specifically for instruction, you’ll get to watch some of the most outrageous moves being done today, using the Illusion, Vapor, Eclipse, 3-D, and Fanatic. You’ll also see some breathtaking indoor flying in beautifully edited sequences that earned Trick Show the "best Media Presentation" award from the International Kite Trade Association. Many of our customers have literally worn out this tape from playing it so many times!